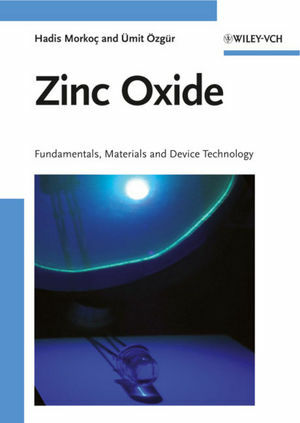 This first systematic, authoritative and thorough treatment in one comprehensive volume presents the fundamentals and technologies of the topic, elucidating all aspects of ZnO materials and devices. Following an introduction, the authors look at the general properties of ZnO, as well as its growth, optical processes, doping and ZnO-based dilute magnetic semiconductors. Concluding sections treat bandgap engineering, processing and ZnO nanostructures and nanodevices. Of interest to device engineers, physicists, and semiconductor and solid state scientists in general. Hadis Morkoç received his Ph.D. degree in Electrical Engineering from Cornell University. From 1978 to 1997 he was with the University of Illinois, then joined the newly established School of Engineering at the Virginia Commonwealth University in Richmond. He and his group have been responsible for a number of advancements in GaN and devices based on them. Professor Morkoç has authored several books and numerous book chapters and articles. He serves or has served as a consultant to some 20 major industrial laboratories. Professor Morkoç is, among others, a Fellow of the American Physical Society, the Material Research Society, and of the Optical Society of America. University, Turkey, and,in 2003, his Ph.D. degree from Duke University, where he has made many contributions to the understanding of ultrafast carrier dynamics in nitride heterostructures. Dr. Özgür has authored over 50 scientific publications and several book chapters on growth, fabrication, and characterization of wide bandgap semiconductor materials and nanostructures based on group III-nitrides and ZnO. He is a member of the Institute of Electrical and Electronics Engineers and the American Physical Society.